Despite the convenience of online shopping, nothing beats the sensation of touch, the ability to see the fabrics and cuts with your own eyes. Thus we are very happy to announce that now you can find Son Trava pyjamas in Aeré store – a thoughtful fashionistas’ oasis in Milan. 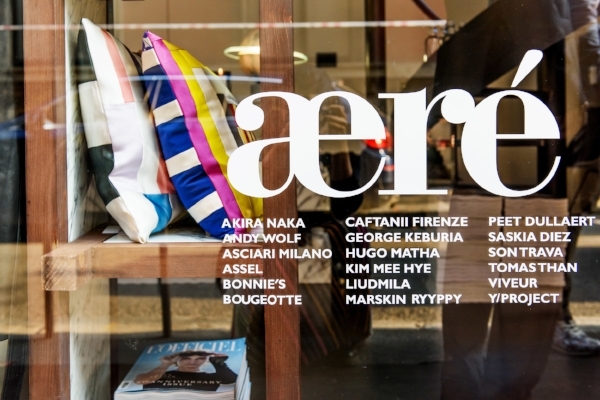 Founded by Azhar Safinova as an online store in 2015, Aeré store has now opened its doors in Milan, on via Lanzone, 7. It is a lovely street in the heart of the city, aside from the tourists beaten tracks. We are proud to share the store space with other independent labels with the same values of high quality and attention to details. Now it is our A/W 2017 collection that is represented at Aeré store but at the opening the lucky guests had an opportunity to see S/S 2018 where all eyes were on our romantic dresses. More on it soon! Our pyjamas and dresses are made from silks and cottons of the highest quality. If you fell in love with a particular pattern on our cotton garment, be 100% sure it is made of the softest jacquard cotton, we prefer it to printed patterns. If it is the feel of silk you want then it is the best quality fabric we give you and our silk prints are all authentic, drawn by hand by Son Trava designer. So come to our Milan ‘point of contact’ and we don’t mind you be all touchy-feely.